I know it has been a while since my last post, work has been really rough on the deadlines so I haven’t had time to even consider doing another post. However, even as deadlines loom it turns out something popped up at work I need to talk about. Now, this seems like a no-brainer, but my agency sent out an email from the EEO department indicating to those who are not aware what the celebration for this month is. This included the link back to the DoD website, and a flyer (I have shown the youtube video for it below). Now, this is super basic, so I really wasn’t paying attention to it. After all I am still fighting to get Jello medical treatment from the DoD. However, one of my supervisors came over and she was super excited about the flyer. 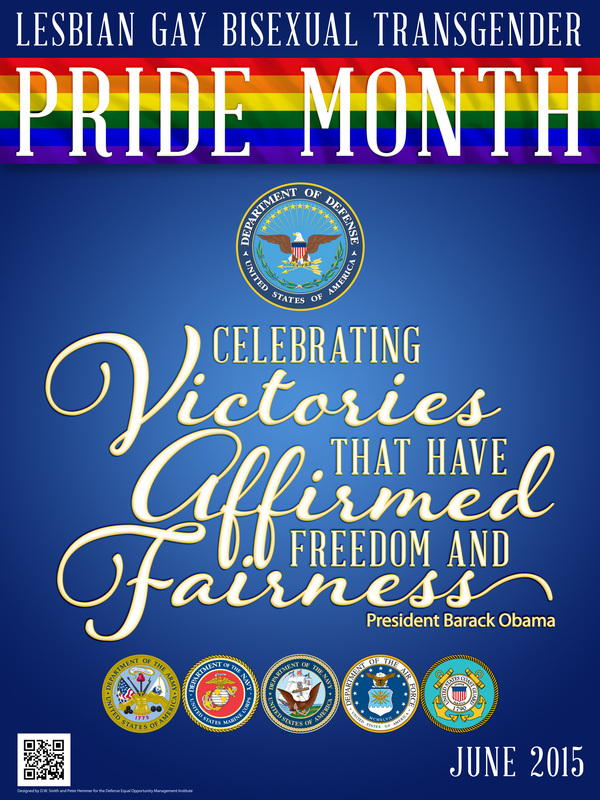 DoD “June is LGBT Month” Poster. Let’s call my supervisor Cat, she is a lesbian and been working with the agency for 28 years (sadly she retires in two weeks and I am really going to miss her). She is the one I go to sometimes when I don’t know how to handle a social situation in the DoD dealing with LGBTA. She was so damn excited and she had printed the flyer off on the color printer and was showing it to me. Evidently in her 28 years the DoD has NEVER done anything like this. Evidently the flyer is a huge deal. She was so excited she was almost in tears. It was an extremely touching moment. She then asked a bit about my EEO complaint, and she was mentioning she felt bad that she was a “coward” (her word, not mine, I would never think that) and never pushed anything during her time in the DoD. She looked surprised when I told her that she was wrong. The fact that for the last 20 years (I think she was stealth before then) she worked openly as a lesbian contributed greatly. Without people like her being there, we would still be 20+ years in the past. Not everyone has to throw their career away fighting the system to be needed. Just being open was enough to help wear the system away. Also let me make it very clear, some people can’t be out in the open and have to be stealth, there is no judgment here, people’s lives are different. I have an inbuilt space for conflict and in fact if I don’t find something to fight for, I end up fighting over stupid things. At least this gives me a better outlet for that resistance to authority. I wouldn’t ever think poorly of someone who wasn’t able to come out, or felt it wasn’t in their best interests. Now, I realize this does not clear the DoD of any wrong doing, and I also realize the results for Jello and healthcare are still pretty dismal. I still think they are 20 years too far behind on where they should, but I thought I would post about their attempts at least. This entry was posted in All Articles, Lucky's Articles (AG) and tagged events, photos, Videos, work. Bookmark the permalink.